← Evacuated after ‘health attacks’ in Cuba and China, diplomats face new ordeals in U.S.
A proposed wireless signal booster project that had drawn some tough questions was pulled last night. Verizon Wireless representative Attorney Daniel Klasnick said his client would rather pull the project for seven small cell boosters planned for telephone poles around town than face a fee that was a condition being discussed by members of the Board of Selectmen. As reported on BNEWS, the proposal from Verizon was brought up in a public hearing back in August. Klasnick of Duval, Klasnick & Thompson LLC, said the small cells are necessary to cover gaps in wireless coverage that develop as more people and businesses use the system. The devices are placed on telephone poles, street lamps and similar structures to boost the signal put out by traditional cell towers. At the time members raised a number of concerns about the project. They asked if the small cells were really necessary, since Verizon’s coverage map did not show any gaps of coverage. They also asked about the chance that in the future Verizon would seek to put more small cells up in town or that other companies would seek to put others up. The number of unanswered questions prompted a special meeting on in September to discuss the issue in further detail. During that meeting it was decided there were enough unanswered questions to require the committee. The committee was formed and tasked with examining the need for small cells, coming up with a policy for new applicants and studying possible aesthetic and health effects of the technology. This week Selectman Jim Tigges, the board’s representative on the Small Cells Committee, said the group had come up with a new policy for small cell applications. The policy contains a number of provisions while filing an application, including setting installation fees, listing the town department that must receive a copy for review and setting up the timeline for approval. – Poles must meet ADA standards. Klasnick said some of those conditions could be met, at least in part. None of the proposed small cell boosters were planned for double poles and at least parts of the devices could be painted though some parts could not, he argued. His biggest concern was the annual recertification which came with a fee, or what he called a “tax.” He said that was no acceptable to Verizon Wireless as it could set up a precedent for other communities and he questioned its legality under federal law. Klasnick also questioned the need for recertification. Still, members of the board said they were leaning towards requiring the recertification and associated fee as a condition of approval. Before they could take that vote Klasnick intervened. “My client respectfully requests to withdraw the petition rather than have a fee,” he said. Board members agreed to the withdrawal and the matter was closed for the time being. I am pleased to report Burlington, Massachusetts proactively formed a Small Cells Committee to develop a policy for reviewing small cell applications. Their criteria includes an annual recertification of equipment installations, with a fee assessed to the telecommunications vendor to pay for town employee time to oversee the recertification process. 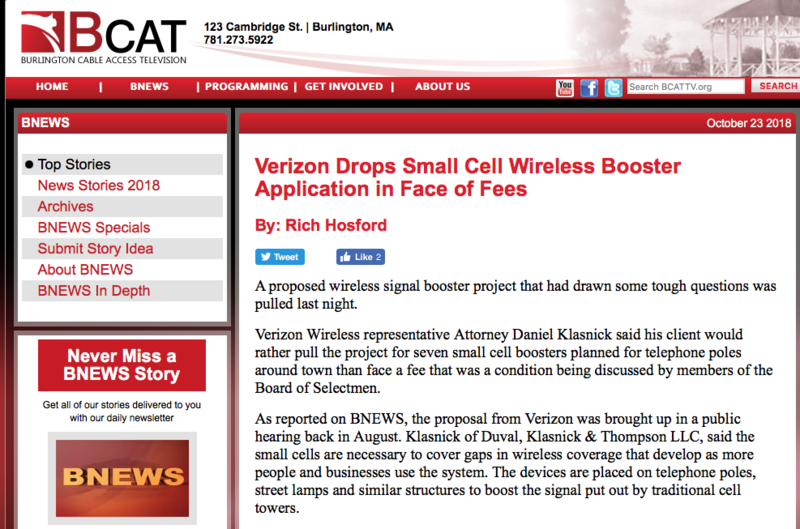 Verizon submitted seven small cell applications and upon learning of the annual recertification requirement and associated fee, the Verizon lawyer indicated his client would like to withdraw the small cell applications as they did not wish to establish a precedent for recertification fees. Please share this email widely, as it provides a playbook that may help other communities ward off 5G small cell infrastructure. We should all be asking our towns if they are receiving applications for small cells, also known as 5G or distributed antenna systems (DAS). If they haven’t already, they likely will so best to have our towns prepared to protect their financial/legal interests and their citizens. Otherwise, we all risk having a 5G cell tower mounted right outside our bedrooms. I would be honored to come speak to other communities as well, please shoot me an email if you are interested. To the many giants on whose shoulders we stand to share this information, thank you for your tireless efforts, brilliance and inspiration!